So it's Friday already! These last few weeks have been flying by! I think it's because I've been in my new position at my corporate job for almost two months now and I have a really great boss so the work days fly by. Oh and Happy Halloween! Today I'm not dressing up...I got nowhere to go! But my boyfriend and I did buy a pumpkin to carve and some candy for any kiddies that happen to stop by. 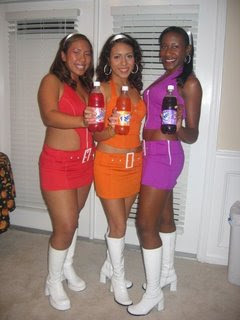 It's crazy because the last two years me and my girls hosted huge halloween parties and always did it up big! We also made sure to do group costumes. Here are our costumes from the last two years. Here we are as the Fantanas two years ago. 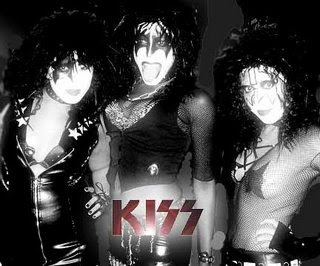 Last year we were the Rock Group Kiss...this is my amateur attempt at Photoshopping. I'm on the left by the way. Oh and I also did the makeup! Anywho, lots of parties this weekend? I have a sweet sixteen gig on Saturday so that's my Saturday night! I've also put myself on a major budget so I'm not going to be doing as much hauling. I'm trying to get my budget on point especially with Christmas coming up. I did buy one palette from the holiday collection but that's it. I'll do a post on my look soon. Meanwhile, I have a million videos to get up in the next two to three weeks. I went out on 2 Friday nights ago for a bday dinner with some of my sorority sisters. I decided to try doing my hair for once and flat ironed it. It's amazing how much blonder and longer my hair looks when I do that! 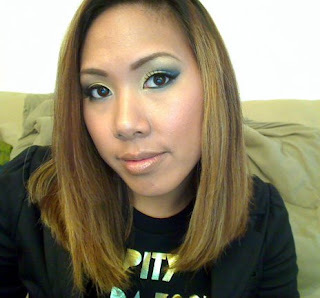 For the look I was attempting to copy the look using one of the Mineralized Eyeshadow trios Interview. I saw someone wearing it on Specktra and I thought it was gorg! 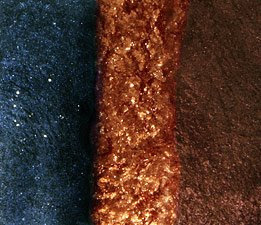 The colors however, are dupeable I feel. I like the grown up feel of this combo, and decided to replicate it on my own! Looking back, I probably should have used more of a bronze than gold, but I still liked the look. My webcam kinda washed out the colors but you get the idea. Like my shirt? 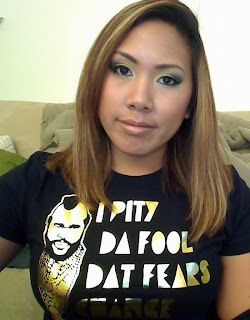 When I was a baby my family used to call me Mr. T because my hair stuck straight up in a flat top shape, lol. Luckily gravity got to it and it started growing downwards instead. The shirt is a freebie from a t-shirt campaign shoot I worked on. Check them out at http://www.sayonme.com/ I'll have a more detailed post on these shirts soon! What are your big Halloween plans this year? Cool halloween costumes... You guys look like you have tons of fun down there in A.
those halloween looks rawk! 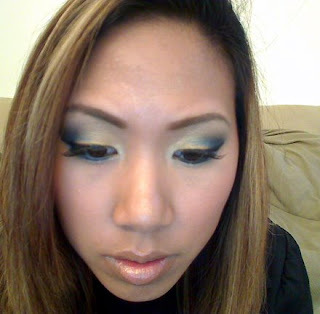 i love the fotd.. as i love a gold and blue combo any how. this look is a sophisticated ren, but still with a colorful edge... your hair looks gorg too! Your hair looks super lighter than it was in your YT videos, did you get it done again ? I am a late bloomer when it comes to makeup. I just got my 1st MAC purchase in the mail. Yeah! I can relate to the budget thing. I have a few things in my shopping cart to get later and build up my "stash." Thank you for sharing so much of yourself to help myself and others. Love your costumes and your hair is lovely. i loove how fresh your make up is.. Thanks for emailing me back, too! halloween is upon us and the great pumpkin king gives out presents! Think i'm gonna hit the halloween parade here in nyc and see a midnight showing of nightmare of elmstreet. I love this! Your makeup is beautiful as always. i lovee your shirttt mann aha my friends did the fanta thing too!